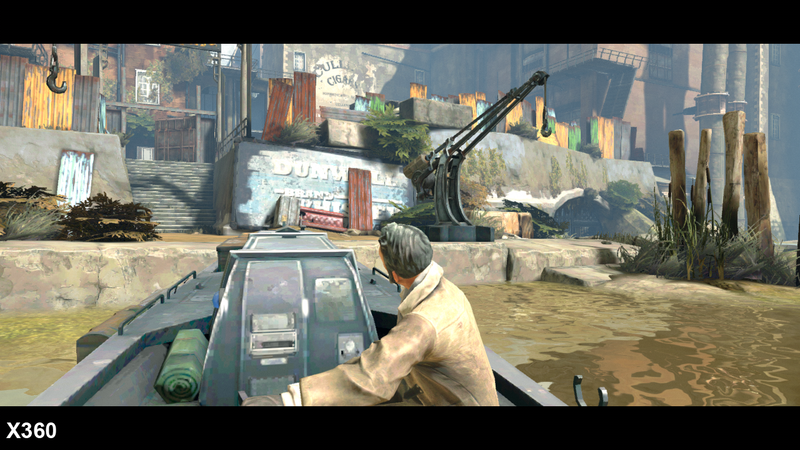 Arriving with a visually distinctive oil-painted aesthetic, Dishonored is one of 2012's biggest surprises. From the off, we're geared up with unearthly skills and weaponry, allowing us the freedom to carve our own way through each mission - be it by slowing down time, possessing wildlife to gain intel or even teleporting across higher-ground routes. Exploring the most obscure corners of its cities often reaps rewards, and finding ways to press forward unseen is typically more satisfying than opting for brute force, though that always stands as a risky last resort if all else fails. From a design perspective, developer Arkane Studios adds plenty of its own ideas to a formula long established by the likes of System Shock. The visual style is particularly striking, with Half-Life 2 art director Viktor Antonov putting forward a brooding, pastel-toned world and cast of characters to service a tale of betrayal. From the smoggy distilleries to the Athenian sheen of the capital city of Dunwall, we see a clash of the industrial and the monarchical at every turn, and each is vividly realised through a very capable iteration of Unreal Engine 3. But which version makes the best of it? 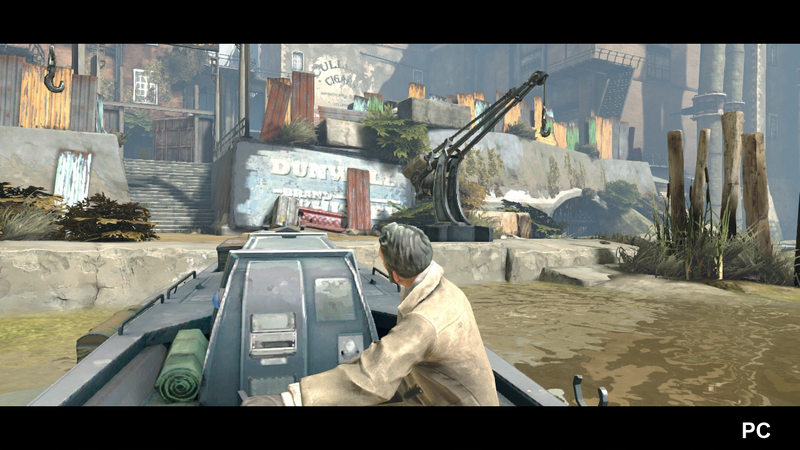 With engine tech in mind, Dishonored serves as an interesting counterpoint to the recently released Borderlands 2. As image quality goes, our Face-Off revealed the 360 had claim to visual features such as light shafts and screen-space ambient occlusion, while the PS3 code offered a superior depth of field effect. 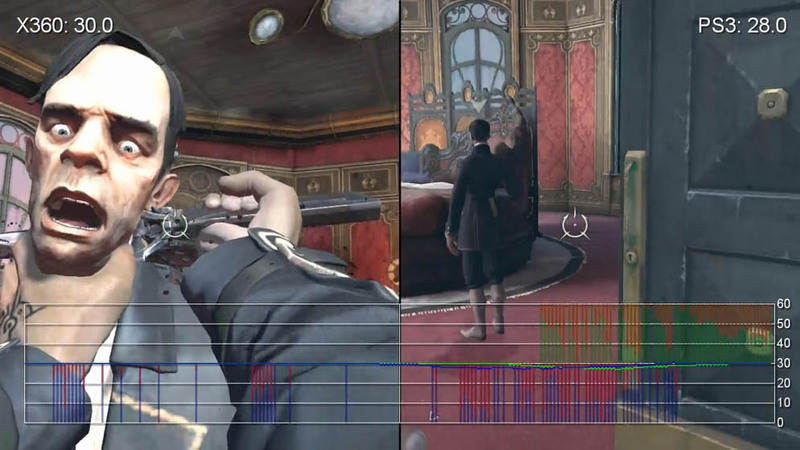 To find out if this also proves to be the case with Dishonored, we take a magnifying glass to the following head-to-head video, and our triple-format comparison gallery. "Even to the most particular of image quality pedants, there isn't much to criticise in the treatment of either console version here, but PC pulls ahead with a number of enhancements unseen on console." Even to the most particular of image quality pedants, there isn't much to criticise in the treatment of either console version here. This time, both releases have the same implementation of the depth of field effect, which flares up starkly behind enemies just as you make a swipe or lunge with your sword. Neither version - PC included - appears to offer SSAO in this case, but Sony's platform does get to show off a use of light shafts in tandem with the 360's, manifesting as a trail of light leading from building edges. The good news continues: resolution appears to be matching at 1280x720, with each format treating this base image to a pass of post-process anti-aliasing. The specifics of precisely which form happens to be in use here can be difficult to pin down. However, enabling FXAA on PC gives us near-identical results to the solution used on 360, which gives us a good indication. A big tell-tale sign of its effect is in the blurriness around fine details, such as plants on the ground. The leaves appear smudged over - certainly by comparison to the PS3's choice of AA. By comparison, the implementation on Sony's format doesn't blur these details to the same extent, and can often provide a clearer image. The downside is that a slight shimmering effect is evident on sharp-lined patterns such as grills or grates. 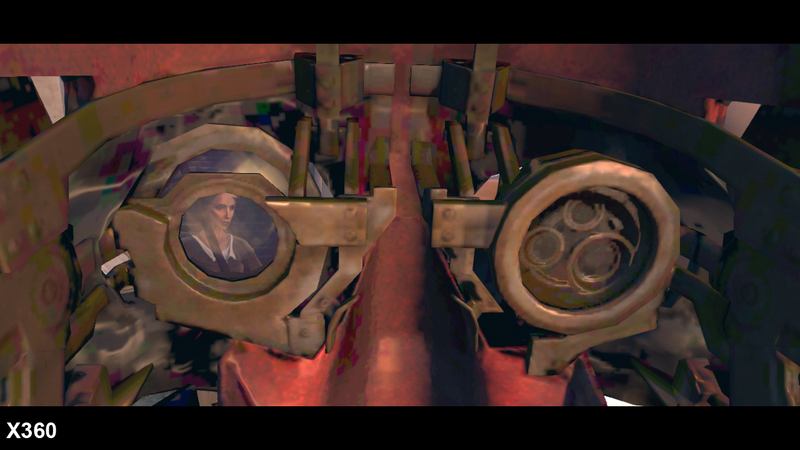 Again, we can turn to the PC version's alternative MLAA mode for a point of reference, where in the place of the blurred surface details, we see a repeatable shimmering in likewise scenarios. On the topic of the PC version, options aren't quite as generous as those seen in Borderlands 2, but what makes the cut is still wholly welcomed. We have the ability to crank texture and character detail up to high, whereas the console versions are stuck at an equivalent to its medium settings. This makes a huge difference to clarity on anything from the dials on boats, to the chipping and moss patterns on the stone pillars around the citadel. Clothing on characters for both 360 and PS3 versions can take on an approximated look when put side-by-side with PC, however, while details for minor objects like giant batteries or floor textures can remain the same regardless of setting. 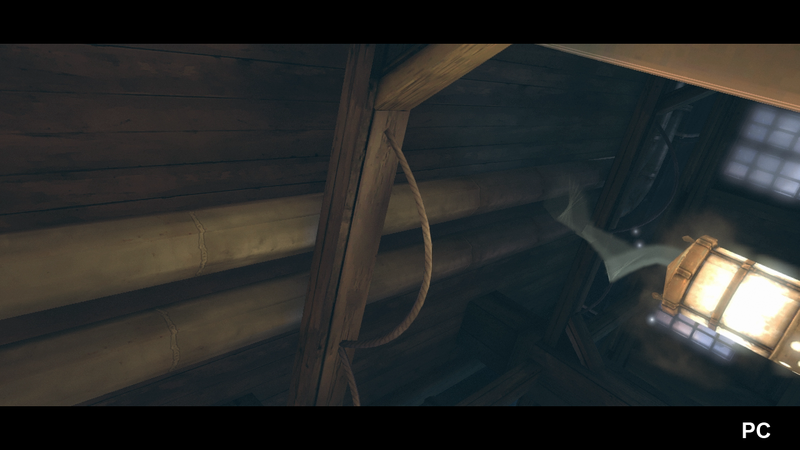 Bizarrely, textures on 360 look more compressed than on PS3 at points. At its most prominent, we see crude bands of green and purple play across surfaces which are otherwise perfectly clean on PC and PS3. To put this into perspective, we have the 360 version installed to its HDD, while the PS3 plays off its 20-minute mandatory install. Even after all assets have finished loading up, we still notice this strange artifact over specific objects on the 360 version, such as the metallic interiors to boats or the inside of Corvo's red mask. 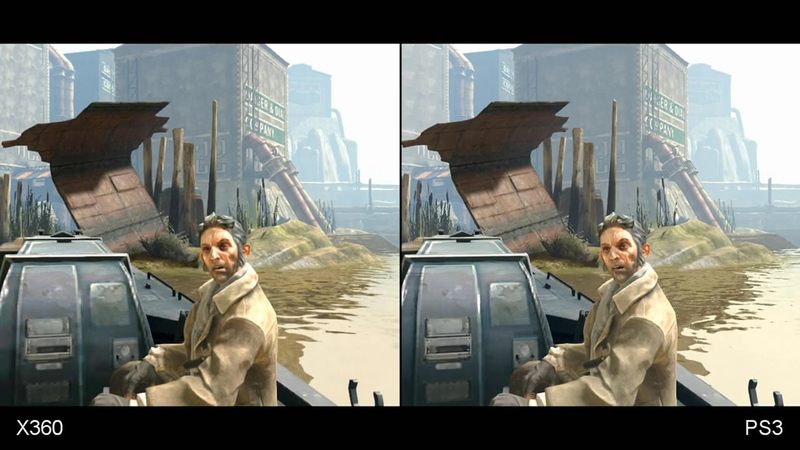 The 360 version's post processing AA makes the plants in the background appear more blurred compared to the PS3's implementation. 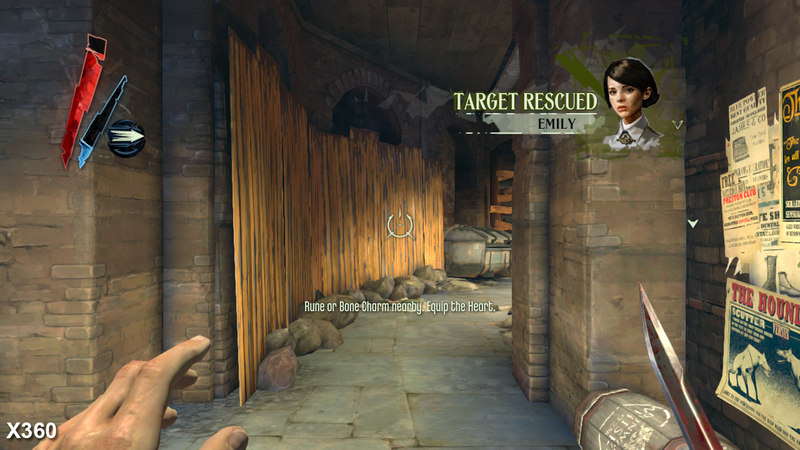 The PC release pictured here is running with MLAA enabled, which comes closest to the look of Dishonored running on Sony's platform. 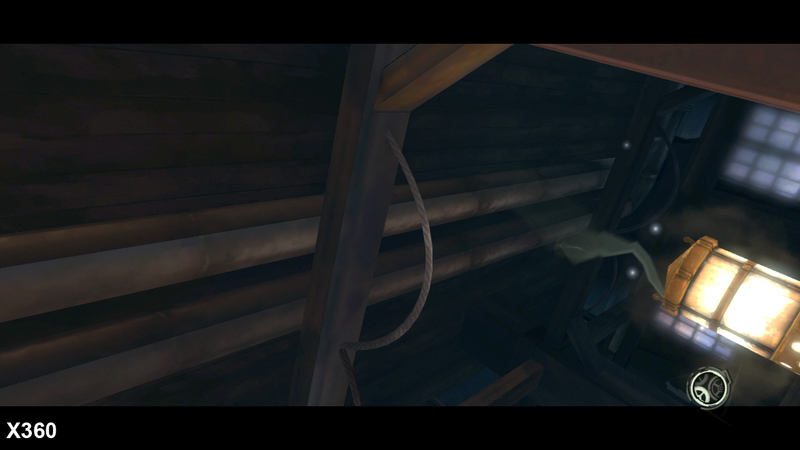 Also note that texture detail suffers the most on 360, and some harsh pixellation can be spotted over the front panel of the boat. The boost to texture quality on the PC version is apparent almost everywhere, but clothing textures are a high point. Here we see the red fabric on Corvo's default mask has a faint woven quality on PC, the details of which are smoothed on PS3 and slightly distorted on 360. This doesn't represent the majority of textures, but rather, occasional details which can crop up regularly. Texture streaming is snappier on PC, and loading times are all but obliterated - whereas consoles take up to 15 seconds when loading missions afresh. Once done, here we even see completely different geometry with higher-res textures being filled in on PC. After the recent release of Borderlands 2, PC clearly is the place to be for the best Unreal Engine 3 experience. Shadows are drawn differently on PS3 at times. In this image we see a wider spread of shadowing on the right wall, and also in between the divots of the yellow fencing and rocks. The play of light still appears natural though, with the exception of the line of shading leading up the wall to the left, which is impossible to find the original source for. Other improvements on the PC side include a field-of-view slider. This can be ramped up to 85 on PC, but remains set at the console value of 75 by default in our captures, just to keep everything in frame. A toggle for turning on light shafts is available too and curiously, there's also means to add shadows for the swarms of rats that lurk the islands. No doubt this proved too much for the 360 or PS3, especially once these creatures start swarming en masse around corpses and so it evidently didn't make the cut. Physics may not be as advanced as Borderlands 2's blood-spilling, fabric-simulating bedlam, but at least certain objects shatter when impacted, such as tables and chairs. The same dynamics are at play on consoles too, where rag-doll physics on enemies can be an especial highlight. One particular battle has us delivering a critical sword-swipe to a guard, who proceeds to smash right through a wooden signpost and then bend half-way over a river-side railing. It's subtly amusing, but gives each enemy a real sense weight and lasting presence. As a result, once you're done it's often a good idea to hoist the body back up again and fling it out of the view of other passing guards. 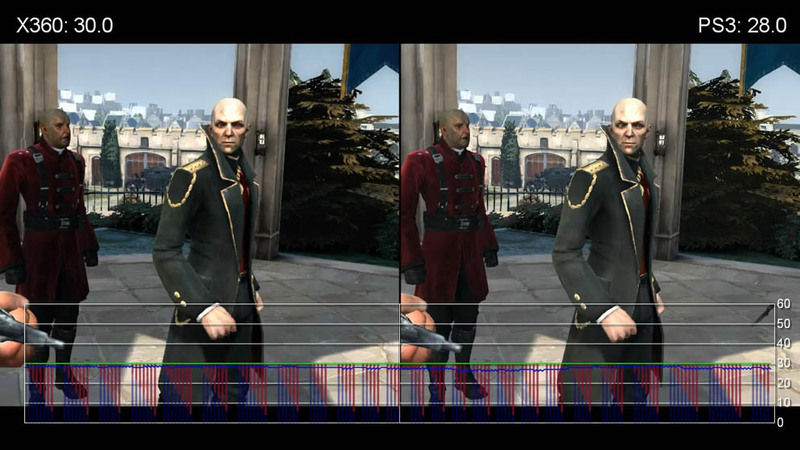 With most things being equal between the three platforms on the visual front, with a few odd discrepancies in terms of texturing and shadowing, let's see how Arkane Studios has optimised Dishonored's performance for each platform. To start, we take a look at the 360 and PS3 versions in both cut-scenes and straight-forward runs around The Hound Pits Pub. 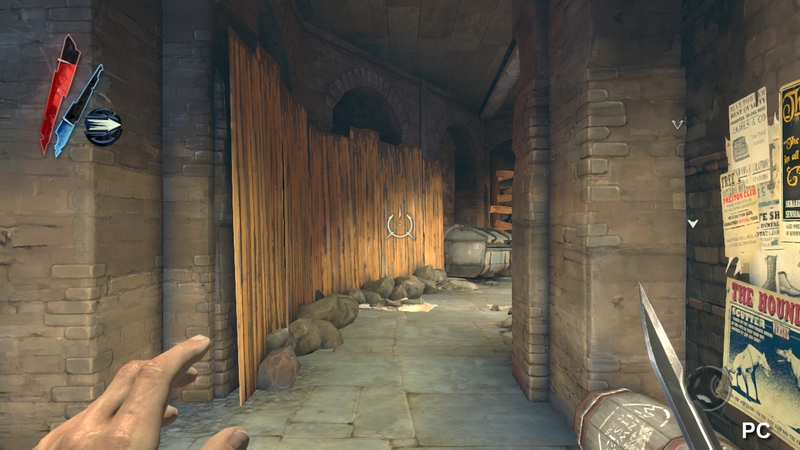 "Cut-scene and traversal tests reveal noticeably more screen-tear on the PS3 version of Dishonored - par for the course with many Unreal Engine 3 titles we've looked at." The rate of tearing on PS3 is mostly a factor during cut-scenes and we don't see an equivalent level of visual degradation on 360 in these moments. It's clear both consoles are adopting a target of 30FPS, with an adaptive v-sync logic that permits frames to tear when under heavy load. In instances with heavy panning across distant scenery, multiple characters, or alpha effects, this tearing can streak across the entirety of the screen in a distracting fashion, but rarely interferes with the game's overall playability. At its worst in these matching clips, we see just a second or two of tearing on 360; the greatest extent of it being nearing around the Golden Cat Bathhouse which packs swathes of NPCs into a small space. Frame-rate is generally solid on PS3, however, and sticks to a smooth 30FPS standard for much of play. In the worst-case scenario, a return boat trip to the pub sees the 360 version capped to the 20FPS line, in place of any tearing whatsoever, while we get a drop to 26FPS at lowest on PS3. 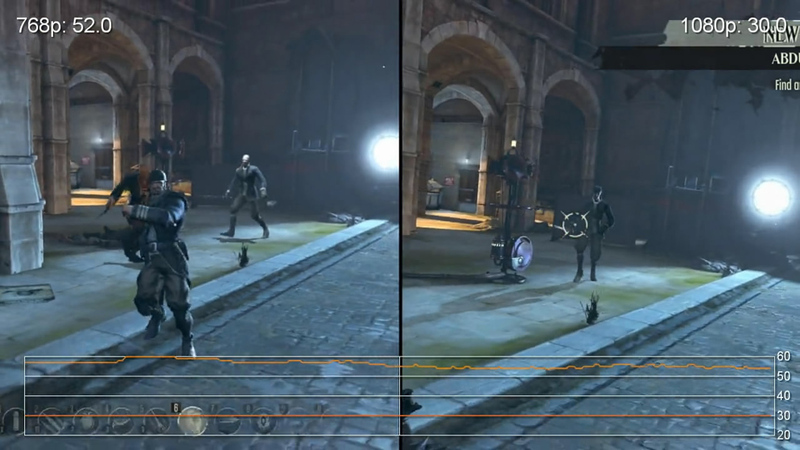 During actual gameplay there's little to divide the two versions, but Sony's hardware does momentarily struggle more during a walk around the Hound Pits area. It's a very similar story to Borderlands 2's performance on consoles in this regard. Though a stealth-based game, you'll still find yourself in situations where fighting back is the only way through. As far as explosive, combat-heavy scenes go, we see little change in terms of frame-rate dips and tearing levels. The 360 stabilises at the target frame-rate for longer spells, while the PS3 drops to 25FPS and loses v-sync where necessary. The exception once again is the busy Golden Cat Bathhouse stage, where each format tears frames constantly while in the thick of it. "During intensive combat scenes, performance disparities between the Xbox 360 and PS3 versions are far less apparent - both of them exhibiting noticeable tearing." We see many of the performance issues here are dominated by an excess of alpha effects too, though these come and go in the blink of an eye. Escaping from Coldridge Prison by blowing the doors off, for example, makes for an even split of tearing between PS3 and 360 due to fire and smoke effects, but this clears within seconds. These results also suggest that, when the going gets tough, neither console can take an identifiable lead over the other, but those with an aversion to tearing might be better suited to the 360 version. To wrap up our performance tests, we also take the PC version for a spin. Of course, there's no stopping someone forking out quadruple figures on a new desktop and playing Dishonored at 1080p60 or beyond. In fact, the game plays very capably at this level on just a GTX 650 backed up by an i5 2500k processor. The flip side is that our £300 Digital Foundry PC is presented with a stiff challenge here, partly due to the fact its 2.8GHz dual-core CPU doesn't quite match 3.0GHz minimum clocks recommended and partly down to UE3 being able to make use of more cores if available. Nevertheless, performance comparisons on PC are divided between 1366x768 and full-HD 1920x x1080 resolutions, both of which should make for a clean 1:1 match for the majority of native HDTVs. Our budget PC is mostly GPU-restricted due to its modest HD 6770 card, but we managed to play Borderlands 2 quite capably at 1080p30, which puts Dishonored in good stead. As we proceed, we keep v-sync engaged, rat shadows and light shafts enabled, and have textures and character models set to high. What is the Digital Foundry PC? Check out the "Introducing the Digital Foundry PC" article for construction details and gameplay testing. Results are truly mixed this time around. Playing at 768p gives us almost 60FPS, but the dips down to 45 are too frequent and sharp for that rate to be tenable and for gameplay to feel smooth. To see the alternative, we set the PC resolution to 1080p, and are surprised to find a 30FPS cap automatically taking effect. The specifications of our build appears well optimised for meeting this figure, and playback feels evened out once again. At least, in spells. Unfortunately, this is only a soft-lock, and the game is prone to dropping this cap and attempting to drift up to 60FPS, only to come hurtling down again shortly after. These fluctuations make the game difficult to play at either resolution. On the plus side, those willing to tinker under the hood will be pleased to know the frame-rate can be manually locked down by changing "MaxSmoothedFPS" value to 30 in the BaseEngine configuration ini. This should allow those on more restrictive setups to comfortably play the game within their hardware's limits. "The PC version of Dishonored is a creditable version with many advantages over the two console builds and is the preferred buy, while the differences between the PS3 and Xbox 360 games are wafer-thin." In all, it's good news for everybody involved. As far as distinguishing points go, we're left with only a couple of oddities between the three formats to call out on. This includes the 360's gaudy splashes of colouring on certain surfaces, which otherwise remain clear on PS3 and PC, and the way shadows manifest in at differing angles on PS3. However, image quality and assets are largely similar, if not precisely identical, between the two console releases, with the PC going the extra mile with higher-grade textures and character models. 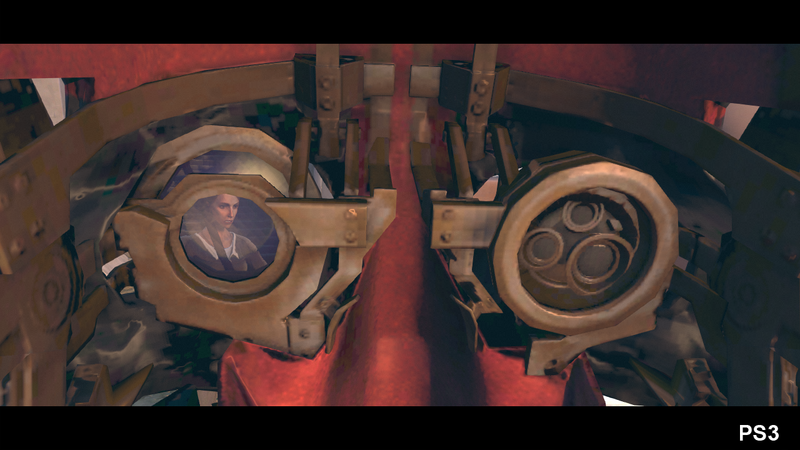 The widened field-of-view of the PC version bears mention too, plus the added accuracy of its mouse controls, which help greatly with lining up long-range projectiles or placing your next blink. Moving straight to the console versions afterwards also brings to light the higher levels of auto-aim worked into their targeting systems, plus the lengthier loading times in-between missions. The PC release may lack the extravagant PhysX bells and whistles added to Borderlands 2, but a respectable level of care has still been taken with this edition. Overall, we've little to complain about when it comes to Arkane Studios' delivery of Dishonored on each platform. The core tenets of its branching stealth gameplay remain intact across the board, and the visuals are tightly pared. If you're steadfast in your console allegiance, the only considerable negative would be the higher rate of tearing on PS3 - though much of this is mirrored by the 360 version during combat. But if dropped v-sync is something you can overlook, the decision may well come down to controller preference, or even your uses for the PS3's 5.1LPCM support. 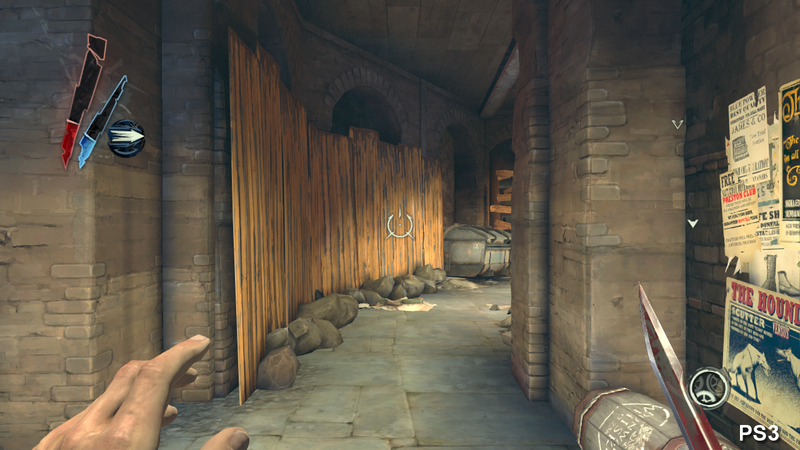 Either way, Dishonored easily arrives as a worthwhile proposition on any platform.